Gitex stands for Gulf Information Technology Exhibition. The event is featured for the whole week. Gitex Technology Week is a great opportunity for the decision makers and the attendees in the information technology and innovation industry to get together. Gitex always brings the latest advancements in technology and also lay the ground for future developments. So as a technology service provider company, what exactly attracts us to exhibit in Gitex Dubai event is the opportunity to transforming concepts into realities. CDN Solutions Group is exhibiting in Gitex Technology Week from last 8 years, and this will be our 9th consecutive time of participation in Gitex Dubai 2017. We feel grateful and thankful to Gitex Technology Week for providing us the great platform to showcase our innovative solutions at the global level, give us a chance to guide startups by converting their one liner concepts into a full fledged solution, learn about new technologies, and guide businesses about latest possibilities in industrial solutions. How to choose technologies to go long lasting, secure and effective. How to do better from competitors. Unique ideas to market and promote your ideas. And as you get progressed, be open to collaborate with someone who add value to your business. So if you are a start-up looking for a desired solution then drop by our stand SR-F4 Sheikh Rashid Hall. We are proud to share that our solution have helped our clients from Dubai (Delivery Champ – an online food delivery system and Salad Jar- an online Salad delivery solution) to collaborate with each other and grow their business. Not only start-ups we also serve other industry verticals such as retail, consumer, enterprises, government, etc. With solutions like online ticket booking, online shopping, connected devices, money lending, taxi booking, location based, job portals, workflow management, warehouse management and many more. Overall, Gitex 2017 will be he next biggest technology show, where you can explore latest technology solutions. 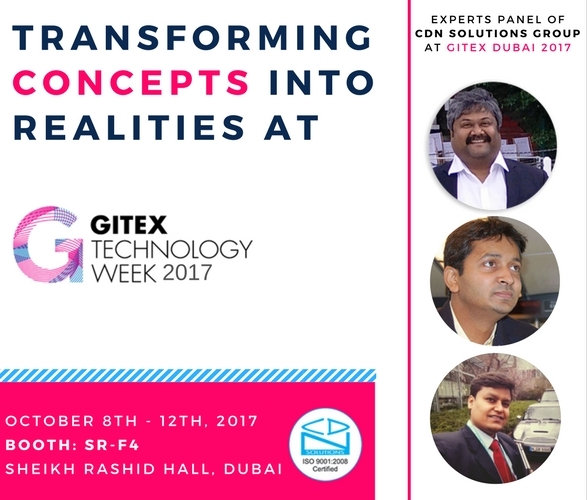 You can meet us in 37th Gitex Technology Week 2017 to transform your ideas into reality at stand SR-F4 in Sheikh Rashid Hall, Dubai. Connect with us now and feel free to fix a meeting to meet in Gitex Dubai 2017 by clicking here.